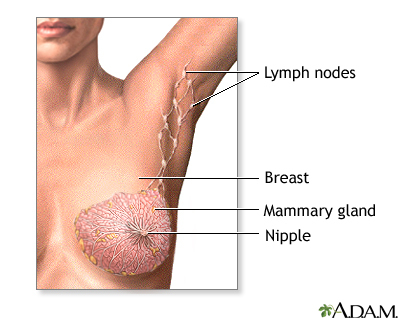 Breast cancer begins in the breast and spreads first to the lymph nodes of the armpit (axilla). When a breast lump is found to contain cancer, and if the cancer has not spread beyond the nodes of the axilla to distant sites, it is often removed surgically. Radiation therapy may be used in addition to surgery. In certain cases of malignant lumps, lumpectomy followed by radiation therapy is as effective as a radical mastectomy. Typically, lumpectomy does not require a breast replacement (prosthesis).